Remember, under the Obama administration, rogue nations such as Iran and Cuba were placed as among the world’s good actors. Hillary went to Russia with a ‘reset button’ and gave Moscow more authority and power in regions of major conflict. Yet it is Congressman Adam Schiff and his friendly democrat friends that are continuing to whine about Trump’s interactions with Russia or Russians. So, Obama set the table on the friendly approach to Medvedev and Putin and Russian aggression around the world has more than threatened equilibrium, it is deadly. Have you wondered why Bashir al Assad has not been brought before a global tribunal for war crimes? UNITED NATIONS – Russia and China on Thursday vetoed a U.N. Security Council resolution referring the Syrian crisis to the International Criminal Court for investigation of possible war crimes, prompting angry responses from the proposal’s supporters who said the two countries should be ashamed. This is the fourth time Russia and China have used their veto power as permanent council members to deflect action against the government of President Bashar Assad. The 13 other council members voted in favor of the resolution. More than 60 countries signed on to support the French-drafted measure, in a dramatic demonstration of international backing for justice in the conflict which has sent millions fleeing and killed more than 160,000, according to activists. More here. As the United States continues to fight against the Taliban in Afghanistan, who has been supplying the Taliban with weapons? Yup…Russia. You see, Russia has training operations with real fighting equipment and when the training is complete, they leave the high tech equipment behind and tell the Taliban to come get it. Did Adam Schiff or Maxine Waters get on TV and demand impeachment over Obama’s relationship with Moscow? Nah…. While not a fan at all of MSNBC, Richard Engle however did an exceptional reporting piece on Putin including who else was to be assassinated by poison, including Christopher Steele of the Trump dossier. So, in solidarity with Britain, the Trump administration took aggressive action in expelling several Russian diplomats (read spies) as did at least almost three dozen other countries. Trump also closed the Russian diplomatic post in Seattle. What was going on there was terrifying and it is questionable on why Obama did not order it closed in December of 2016. Read below for what the FBI knew and yet was unable to take action due to the Obama White House. Among the 27 countries that have retaliated for what is believed to be a Kremlin-ordered chemical-weapon attack on an ex-Russian intelligence officer and his daughter in Britain earlier this month, the United States took by far the most dramatic steps: ousting 60 diplomats in total, including 15 suspected intelligence operatives based at Russia’s United Nations Mission alone—the most significant action of its type since the Reagan administration. (The move prompted Russia, on Thursday, to announce the expulsion of 60 U.S. diplomats and the closure of the U.S. consulate in Saint Petersburg.) But it was the Trump administration’s announcement of the shuttering of Russia’s consulate in Seattle that turned heads. Why Seattle? What was going on there? Would the closure matter? While Seattle is an important city for Russian intelligence collection efforts domestically, its consulate’s profile has generally been quieter than San Francisco’s or New York’s, according to two former U.S. intelligence officials who asked to remain anonymous but have knowledge of Russian activities in these areas. 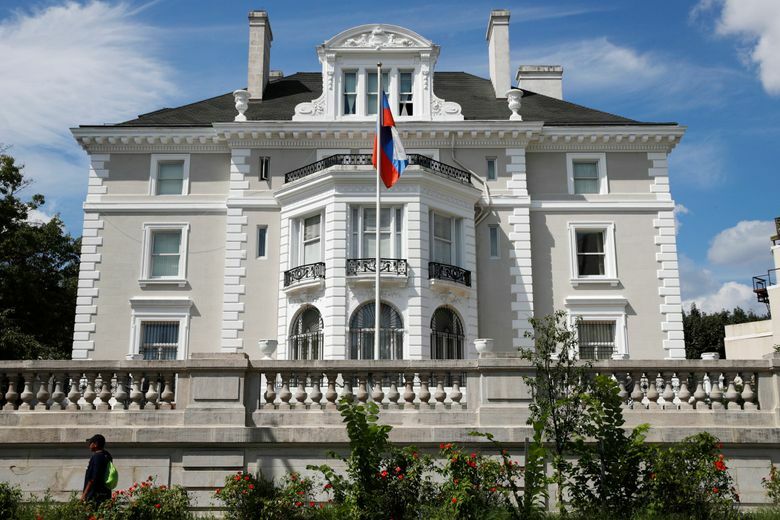 But the closure of the consulate is noteworthy nonetheless: Along with the administration’s shuttering of the San Francisco consulate in 2017, Russia will now lack a diplomatic facility west of Houston, or any diplomatic presence on the West Coast for the first time since 1971. Russian intelligence officers—at least those under diplomatic cover—will no longer operate in easy proximity to America’s two great tech capitals. Indeed, at least in Seattle, suspected Russia spies have already been caught attempting to infiltrate local tech companies. After the closure of the Russian consulate in San Francisco, former senior U.S. intel officials told me that facility had, for decades, functioned as the primary hub for Russian intelligence-gathering in the Western United States. It featured key classified communications systems, and was a crucial collection center in Russia’s long-running effort to map out America’s fiber-optic cable network. One of the two anonymous former intelligence officials I spoke with called Seattle a top-five U.S. city for Russian counterintelligence work, but a “smaller operation” than San Francisco. Seattle did not have the same type of communications facilities as San Francisco, the two former officials said. In fact, Russian diplomats used to regularly drive a van with protected diplomatic information from San Francisco to Seattle, said a second official, though the frequency of those trips decreased over time, when U.S. officials suspected the Russians had begun to move their communications to encrypted channels online. Still, the Seattle area has some rich espionage targets. Firms like Boeing and Microsoft have long been of interest to Russian operatives, the former intel officials said. So have the many military bases in the area, including, pre-eminently, Naval Base Kitsap, located just across the Puget Sound from Seattle and home to eight nuclear-armed submarines. Administration officials have openly cited the Seattle consulate’s proximity to Boeing, and sensitive military bases, as reasons for its closure. Because there is a seven-hour float from Kitsap to these nuclear-armed submarines’ dive point, the two former officials said, there are numerous opportunities to track the subs’ movements—a longstanding concern for U.S. intelligence and military officials. Knowing when a submarine is headed out to sea or how many submarines are running patrols at a given time, and potentially identifying new technologies on these vessels, are all valuable pieces of intelligence, these officials said. Moreover, U.S. intel officials have worried that in a worst-case-scenario—actual armed hostilities between the two countries—information gleaned from Russian operatives in the Pacific Northwest could be used to identify “choke points.” For instance, they might know the ideal places to fire a rocket-propelled grenade at a fishing boat in a narrow channel, which could prevent military vessels from deploying. More recently, however, these activities appeared to die down, these individuals said, an event one of the former intel officials attributes to Edward Snowden’s 2013 disclosures, which some in the intelligence community believe led Russia to overhaul its strategies for domestic intelligence-gathering. Generally, this person said, Seattle seemed like a “proving ground” for junior Russian intelligence officers, a place to send less-experienced operatives to acclimate them to the United States. After Snowden, U.S. intel officials started seeing more “travelers” in the Seattle area—suspected intelligence operatives working under both diplomatic and nonofficial cover—flying in remotely to meet with individuals, the two former officials said. “Was Kaspersky looking at Microsoft or Boeing as opportunities to exploit? Was it just business development? Or were they actually engaged in trying to penetrate these enterprises?” asked one of the former officials. “The suspicions on Kaspersky have pretty much been borne out … when you look at the recent U.S. government decision, and what has been publicly reported on what the Israelis have been able to find out.” In 2017 the New York Times reported that Israeli intelligence had hacked into a Russian espionage operation, observing Russian operatives using back doors in Kaspersky software to scan for, and purloin, U.S. intelligence documents. Russia’s interest in Microsoft is also well-documented. In 2010, U.S. officials deported Alexey Karetnikov, a 23-year-old Russian national, from the Seattle area, where he had been working at Microsoft as a software tester. U.S. officials believed he was actually a Russian intelligence officer, and linked him to the ring of 10 “illegals”—Russian deep-cover operatives who had been living in the United States—that U.S. officials had arrested and deported earlier that year. Two of those undercover operatives, Michael Zottoli and Patricia Mills (whose real names are Mikhail Kutsik and Natalia Pereverzeva), had lived in Seattle for years, even starting a family there. In Seattle, Kutsik worked at a telecommunications firm, and both operatives took finance classes at the University of Washington. In a 2017 article in Seattle Met Magazine, Kutsik and Pereverzeva’s former investments professor said he believed the Russians were interested in his class because many of his students went on to work for Amazon, Boeing or Microsoft. Kutsik, Pereverzeva and Karetnikov were not known to have been coordinating their activities with the Seattle consulate, one of the former officials said. Even as Russian espionage continues to migrate outside consular facilities—to travelers, and individuals working locally under nonofficial cover—it is “no coincidence” that both shuttered diplomatic outposts were on the West Coast, said one of the former officials. No matter when—or if—these two consulates are reopened, Russian interest in the West Coast is likely to continue far into the foreseeable future. Where is Adam Schiff now? Posted in Citizens Duty, Cyber War, Department of Homeland Security, DOJ, DC and inside the Beltway, Failed foreign policy, FBI, Military, NSA Spying, Russia, Terror, The Denise Simon Experience, Treasury, Trump Administration, UN United Nations Fraud Corruption, Whistleblower.